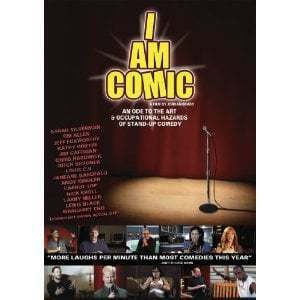 You MUST see I Am Comic directed by Jordan Brady. This amazing film features dozens of stand-up comedy stars like Tim Allen, Sara Silverman, Jeff Foxworthy, Jim Gaffigan, Kathy Griffin, Tommy Davidson and many more! I should also mention that myself (Steve Roye) and my Comedy Evaluator Pro software are also featured in this film (much to my surprise). Through unprecedented backstage access and candid interviews, the film weaves through the absurd world of the working comedian and reveals a crazy and hilarious psychological profile of its practitioners. Retired comedian Ritch Shydner is the host and the film also chronicles his attempt to climb back on stage after a thirteen-year hiatus. At the top of the world in stand-up comedy in the 1980’s, Shydner had HBO specials, shot five pilot TV shows, and had numerous late night appearances (Carson, Letterman, Leno, etc.) but the big time eluded him. In the film, Ritch takes another shot at stand-up comedy. Does Ritch have what it takes to connect with today’s young crowds and still get the laughs? This entry was posted in Editorial and tagged candid interviews, comedian, comedians, comedy evaluator pro, comedy stars, DVD, jeff foxworthy, Jim Gaffigan, Jordan Brady, kathy griffin, letterman, tim allen, tommy davidson by Steve Roye. Bookmark the permalink. I Am Comic is well worth the investment. “Get real” is an old cliché, but it sure fits this documentary. The insights and struggles that balance with the highs and lows paint a clear picture of the commitment needed for stand up, just like every other demanding profession. Ritch’s story is compelling. The part with you and Comedy Evaluator Pro was very poignant. It’s on Netflix, and a great watch. If your thorough wealth of information provided doesn’t prove you have credibilty, hopefully the movie will. For the movie makers to interview so many truly famous and sucessful current and past comedians, and then seek you out to use YOUR SOFTWARE AND get YOUR OPINION, obviously you are very well respected in the industry. Nuff said. ← Previous Previous post: Which Successful Comedians Have This Specific Trait?